By 1931, Dorsey had formed one of the nation’s first gospel choirs at Chicago’s Pilgrim Baptist Church. Upon the death of his wife and baby the following year, Dorsey wrote the famous, Precious Lord, Take My Hand. 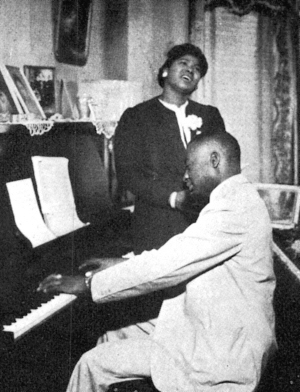 Soon afterward, he discovered the young singer Mahalia Jackson, and was her accompanist throughout the 1930s and 1940s. He traveled widely throughout his life, teaching workshops and leading choruses, while composing over 800 gospel pieces. Reflecting back, Dorsey said, “Gospel is good music sent down from the Lord to save the people…There is no such thing as black music, white music, red or blue music…It’s what everybody needs.” For his many contributions, Thomas Dorsey has been called the Father of Gospel Music. Michael W. Harris, The Rise of Gospel Blues (New York: Oxford University Press, 1992); James Standifer, Interview with Thomas Dorsey, 1980. African American Music Collection, University of Michigan School of Music, at http://www.umich.edu/~afroammu/standifer/dorsey.html .